For more than a century LDBC has been filled with amazing spirit and traditions. Generations of men consider their time at LDBC a cherished part of their lives. 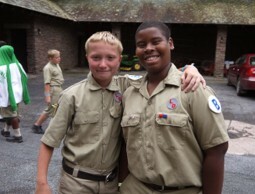 LDBC is fun: sports, swimming, adventure activities, overnight camping, new friends and much more. LDBC is about personal growth. Our unique academy-style program teaches boys personal responsibility and provides incomparable opportunities to learn leadership skills. Older campers are given positions of leadership which challenges them to inspire younger campers to perform their best in weekly parades and in sports competitions. Our renowned Crack Platoon and Drum and Bugle Corp encourage campers to hone their skills and be proud of their accomplishments. These activities are among the most cherished traditions at LDBC. LDBC is about encouraging boys to become spiritually aware through singing grace at meals and attending chapel services in the tradition of the Episcopal Church. Worship takes place in our beautiful, simple wooden St. Joseph’s Chapel or at the Outdoor Chapel in a nearby hemlock grove. The entire LDBC program teaches showing respect for everyone. LDBC is committed to the highest standards of safety and is known for the maturity and dedication of its staff. It is routinely rated among the safest camps in New York State.